Your car, truck, boat, motorcycle, and outdoor power equipment’s performance is dependent on the quality of fuel you use. 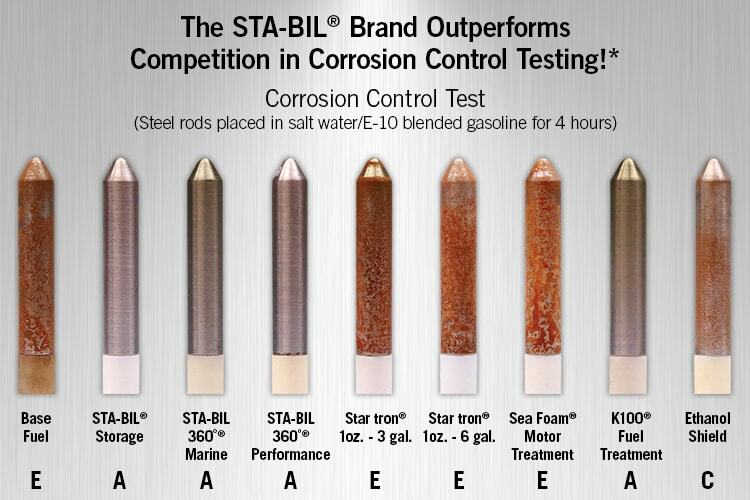 For over 60 years STA-BIL® has scientifically engineered the highest quality fuel stabilizers and ethanol treatments that outperform the competition. We rigorously test these products both in our laboratory as well as third party testing facilities. 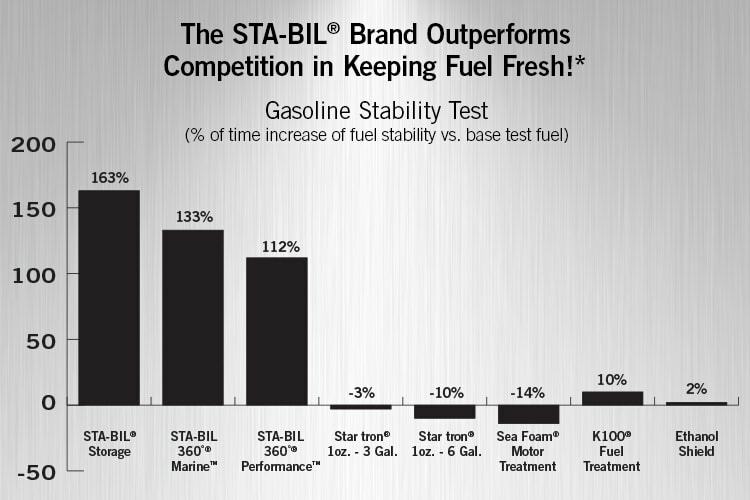 STA-BIL Keeps Fuel Fresh 163% Longer Than Base Fuel. *Test conducted using modified ASTM D525/ASTM D4814 Automotive Spark Ignition Engine Fuel standard, using E10 blended gasoline. ASTM D525 is a short-term stability test that accelerates oxidation by heating the fuel sample to 212°F, which may exceed normal fuel system operating temperatures. Test performed by independent testing lab. Base fuel contains no fuel stabilizing agents or other additives and may vary in composition from E10 fuel purchased at the pump. Chart shows % increase in fuel stability score – measured by the number of minutes until a 20% oxygen pressure drop occurs – for baseline test fuel blended with treatment additives per label instructions as compared to the stability score of the same baseline fuel, unadditized. All tested fuels, including the unadditized baseline test fuel, obtained a score greater than 240 minutes, the minimum standard for short-term stability under ASTM D4814, for fuel leaving a refinery. *Corrosion Control test is an accelerated corrosion test based on a modification of the NACE TM 0172 test protocol, replacing distilled water with synthetic sea water per ASTM D665 Part B. Synthetic sea water is more likely to cause corrosion than distilled water. Untreated carbon steel rods depicted placed in a base fuel blend of E10 gasoline and synthetic sea water for 4 hours. Grades “A” & “B” are passing grades, “C” and below fail the standard. Testing and grading performed by independent testing lab. Baseline test fuel contains no corrosion-inhibiting agents or other additives and may vary in composition from E10 fuel purchased at the pump.